After four years of war in Iraq, the journalists reporting from that country give their coverage a mixed but generally positive assessment, but they believe they have done a better job of covering the American military and the insurgency than they have the lives of ordinary Iraqis. And they do not believe the coverage of Iraq over time has been too negative. If anything, many believe the situation over the course of the war has been worse than the American public has perceived, according to a new survey of journalists covering the war from Iraq. A majority of journalists surveyed say most of the country is too dangerous to visit. Nine out of ten say that about at least half of Baghdad itself. Wherever they go, traveling with armed guards and chase vehicles is the norm for more than seven out of ten surveyed. Even the basics of getting the story are remarkably difficult. Outside of the heavily-fortified Green Zone, most U.S. journalists must rely on local staff to do the necessary face-to-face reporting. 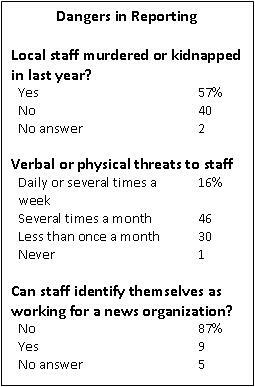 Yet nearly nine out of ten journalists say their local staff cannot carry any equipment—not even a notebook—that might identify them as working for the western media for fear of being killed. Some local staffers do not even tell their own families. Most journalists also have a positive view of the U.S. military’s embedding program for reporters. While they acknowledge the limited perspective it provides, they believe it offers access to information they could not otherwise get. And most journalists, eight out of ten, feel that, over time, conditions for telling the story of Iraq have gotten worse, not better. The survey, conducted by the Project for Excellence in Journalism from September 28 through November 7, was developed to get a sense of the conditions journalists have faced in trying to cover the war over the last couple of years. It was not designed to poll their sense of the situation in Iraq at this one or any other particular moment in time, or to offer a referendum on the success of the surge. It will be followed, later this year, with a content analysis of coverage on the ground from Iraq. The survey included responses from 111 journalists who have worked or are currently working in Iraq. The vast majority, 90 of them, were in Iraq when they took the survey or have worked there in 2007, and most have spent at least seven months in the country cumulatively since the war began. Nearly everyone surveyed also responded to open-ended questions – often at length – offering a vivid and sobering portrait of trying to report an extraordinarily difficult story under terrifying conditions. “Welcome to the new world of journalism, boys and girls. This is where we lost our innocence. Security teams, body armor and armored cars will forever now be pushed in between journalism and stories,” one bureau chief declared. The Project for Excellence in Journalism, which is non-partisan and non-political, is one of eight projects that make up the Pew Research Center in Washington, D.C., a “fact tank” funded by the Pew Charitable Trusts. Princeton Survey Research was contracted to host and administer the online survey. 1. Once these news organizations were identified, and email addresses of the journalists who had worked in Iraq secured, the survey was conducted online with the promise that the individual identities of the correspondents, as in most surveys, would remain confidential. The response rate was 61%.